The U.S. Department of Transportation (DOT), in coordination with the NRC, sets rules governing the packaging of nuclear materials. 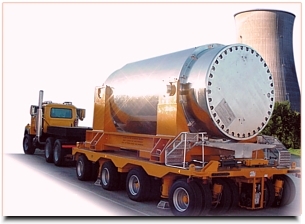 With NRC and the affected states, DOT regulates the transport of nuclear materials. The DOT also regulates carriers of nuclear materials, sets standards for transportation routes, and is responsible for international agreements on the transport of all hazardous materials. The U.S. Department of Energy (DOE), among other things, oversees the development of disposal systems for spent nuclear fuel from the nation's nuclear power plants. This activity has been entirely funded by fees collected from nuclear power plant companies and ultimately from rate payers.